The fighting along the Italian Front during World War One has never garnered the attention paid to the Western Front-- or even the Eastern Front. Perhaps it was seen as a sideshow-- but it was not a sideshow to the millions of Italian and Austro-Hungarian troops who were killed or wounded there. Or maybe it was thought to have a minor impact on the war as a whole. Italy's war aims were to wrest contested territory from Austria-Hungary, especially Dalmatia on the eastern side of the Adriatic Sea. This self-serving goal (though who's to say that war in general is not self-serving) tied down millions of Austro-Hungarian troops which could have bolstered the Central Powers' fight against the Russians on the Eastern Front. If the Russian Army had collapsed earlier than it did in 1917, the outcome on the Western Front, and hence the war, could have been very different. The front stretched about 400 miles from Switzerland in the west to the Adriatic Sea in the east-- mostly in the Alps along the two countries' shared border in northeastern Italy. Austria-Hungary managed to occupy and fortify favorable positions high in the Alps, intending to fight a mostly defensive war. 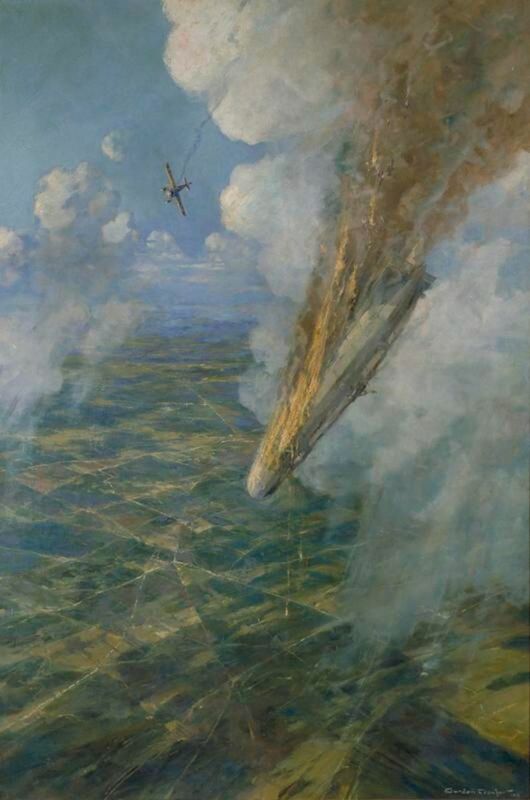 The conditions along this front were brutal and among the worst anywhere in the war. 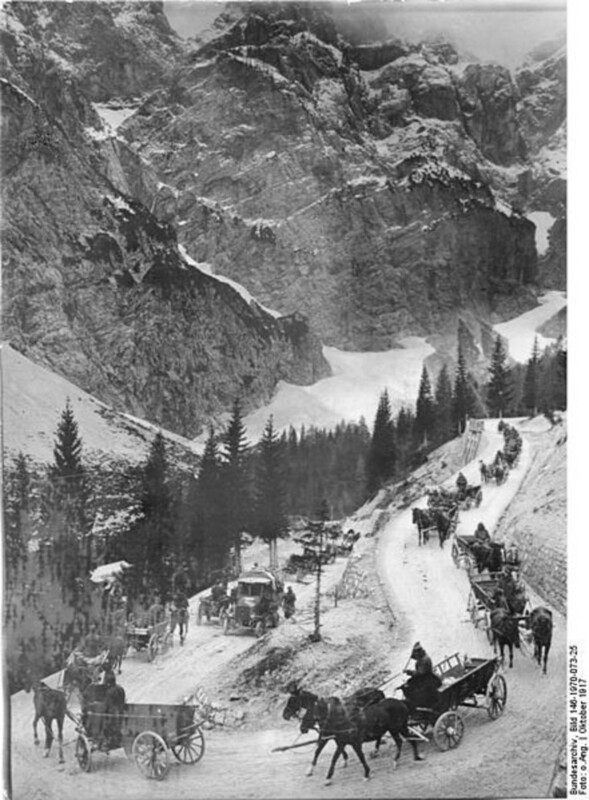 In addition to the vicious Alpine winters, with frostbite and avalanches to contend with (an estimated 40,000 died in avalanches-- about 10,000 on December 13, 1916 alone), the solid mountain rock magnified the deadly effect of artillery as shrapnel and rock tore through soldiers much more effectively than, say, in the soft mud of Flanders. 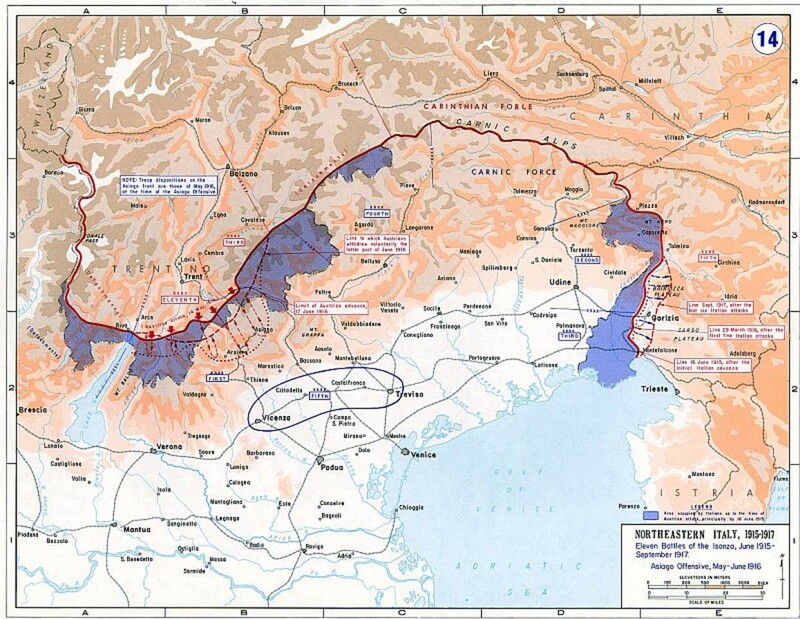 The Italians generally assumed the role of aggressor, with most of the fighting occurring around the Isonzo River along the eastern part of the front, which, ending at the Adriatic Sea, basically ran north-south. 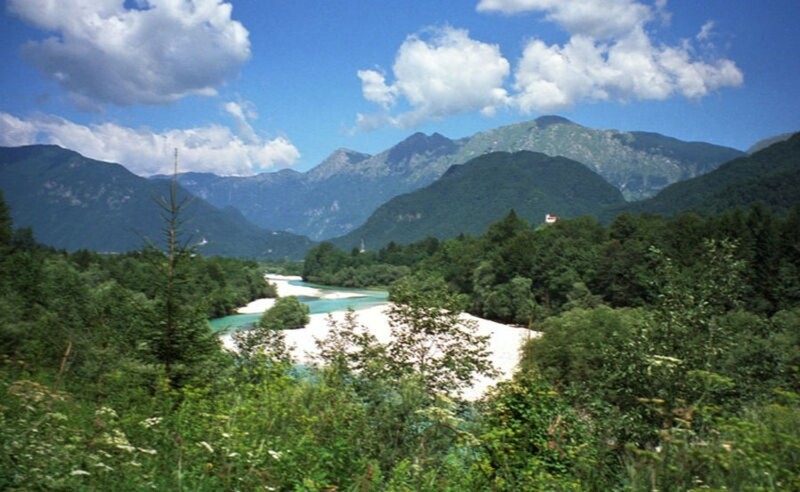 During the war, twelve battles alone were fought along the Isonzo River, with the Italians initiating eleven of them. 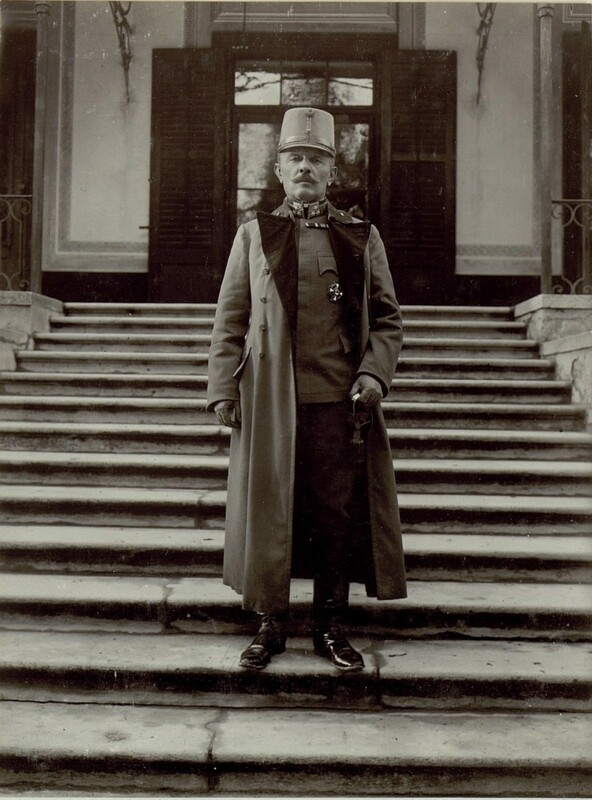 Italy stayed out of the war that started when Austria-Hungary invaded Serbia on July 28, 1914. Although a member of the Triple Alliance with Germany and Austria-Hungary, its membership was half-hearted, especially because it had long had designs on Austro-Hungarian territory along its borders. When its partners declared war, Italy insisted the alliance was only defensive in nature and therefore it was not obligated to be dragged into the conflict. As a result, during the opening months of the war, the Triple Entente (France, Britain and Russia), tried to coax the Italians to join them instead. 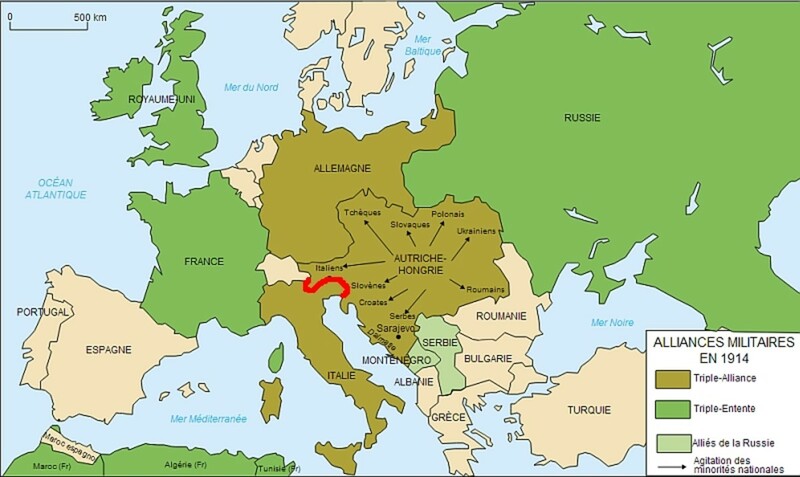 Had the Italians thrown in with Germany and Austria-Hungary, the Allies would have been hard-pressed to defend the additional 200 or so miles of front on the French-Italian border south of Switzerland. Italy signed the Treaty of London on April 26. 1915, which promised the Italians territories that were currently part of Austria-Hungary. In return, Italy declared war on Austria-Hungary (but not Germany) on May 23. Italy went on the offensive, but, despite initially outnumbering the Austrians three-to-one, didn't achieve their goals. Neither Germany or Austria-Hungary were surprised by Italy's turn-about and the Austrians were dug in on the high ground along nearly the entire front. The only practical area of the front for the Italians to attack was to the east across the Isonzo River into Austro-Hungarian territory, but even here the Austrians held the high ground. The Italians launched four offensives across the Isonzo starting in June and ending in December, all repulsed by the Austrians. In March, the Italians launched the Fifth Battle of Isonzo, which quickly failed. In May, the Austrians launched their first offensive further west. 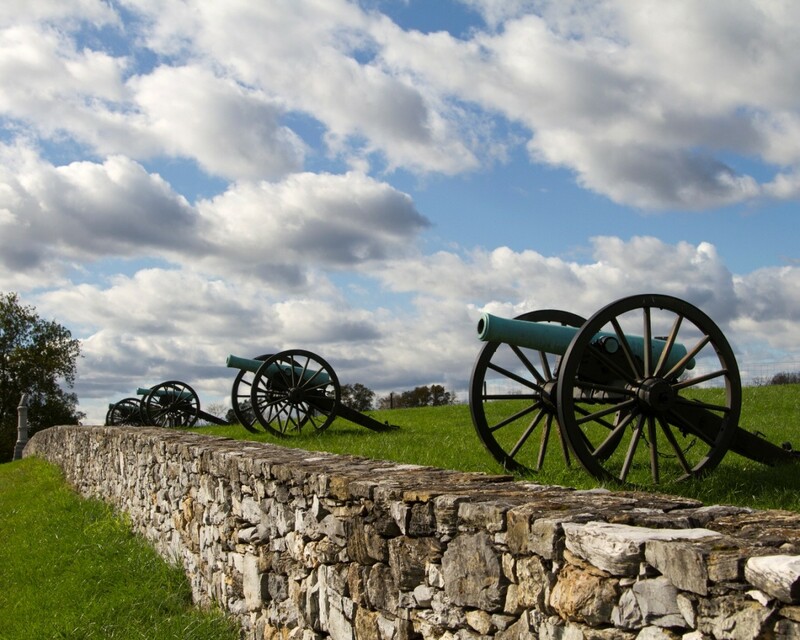 Known as the Battle of Asiago, the aim was to sweep down onto the northern Italian plains. The Austrians also didn't get very far. The Italians declared war on Germany on August 27, 1916. 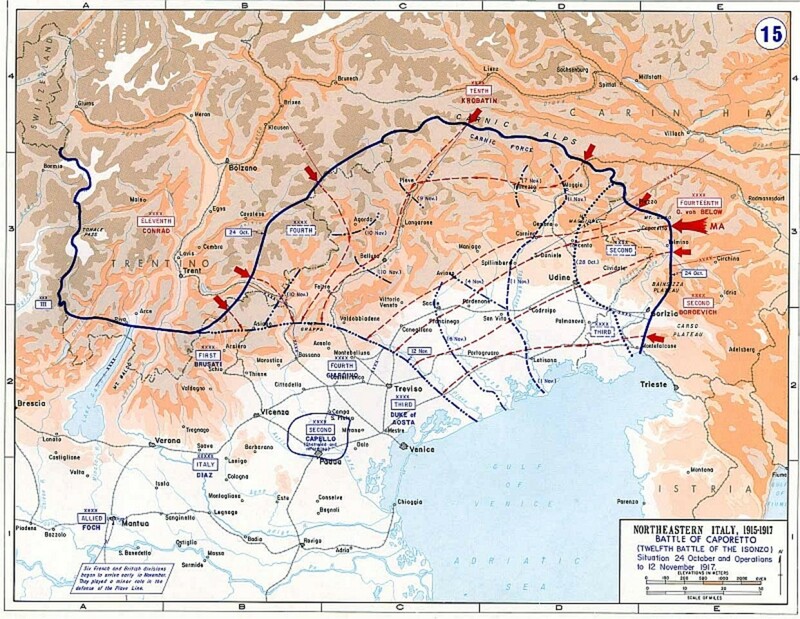 Before the end of the year, the Italians tried four more times to break through along the Isonzo. All failed. In May and August, the exhausted Italians launched the Tenth and Eleventh Battles of the Isonzo. The Austrians also were near breaking and the Italians managed to capture some ground, but were unable to break through. At this point, the Austrians asked for German help. Having decisively repulsed the Russians, the Germans sent six divisions and prepared for what would be the Twelfth Battle of the Isonzo (also called the Battle of Caporetto after the Italian town of that name-- now called Kobarid and part of Slovenia). On October 24, the Austrians and Germans attacked and pushed the Italians back 15 miles on the first day. By the time it was over in November, they had pushed the Italians back nearly 100 miles in one of the most spectacular advances of the war. 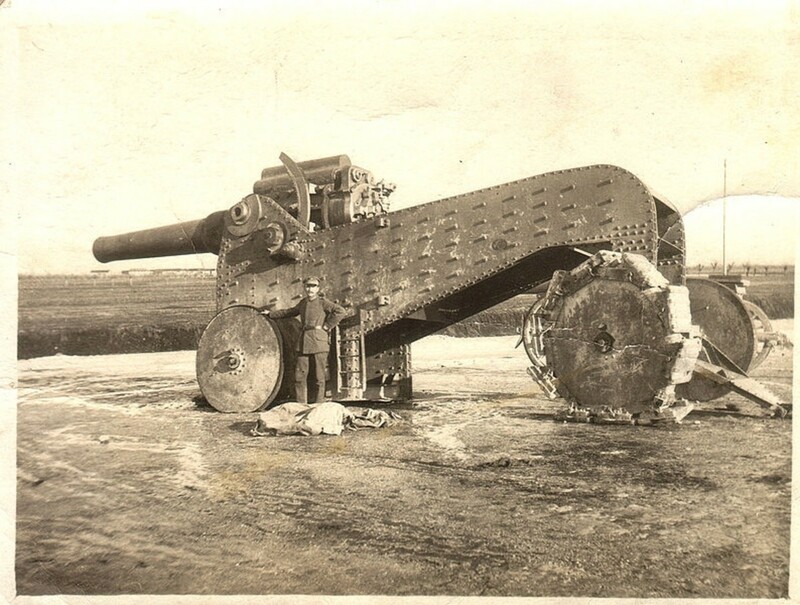 The Italians suffered some 300,000 casualties, mostly taken prisoner, and lost all of their artillery. Unfortunately for the attackers, they outstripped their supply capability and thus the offensive ended 20 miles short of Venice in November. Alarmed by the Italian situation, the British and French sent ten divisions as well as coal and steel for Italy's war industries. 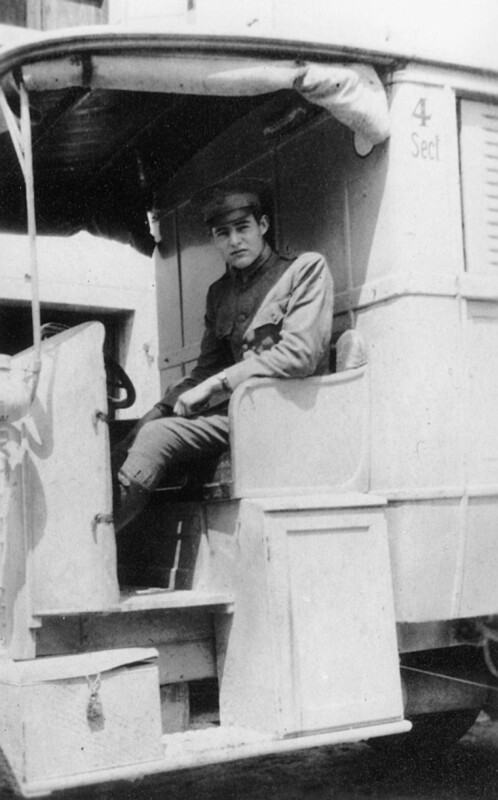 Some American volunteers also went to the Italian Front-- including a very young Ernest Hemingway, who was severely wounded performing his duties as an ambulance driver. 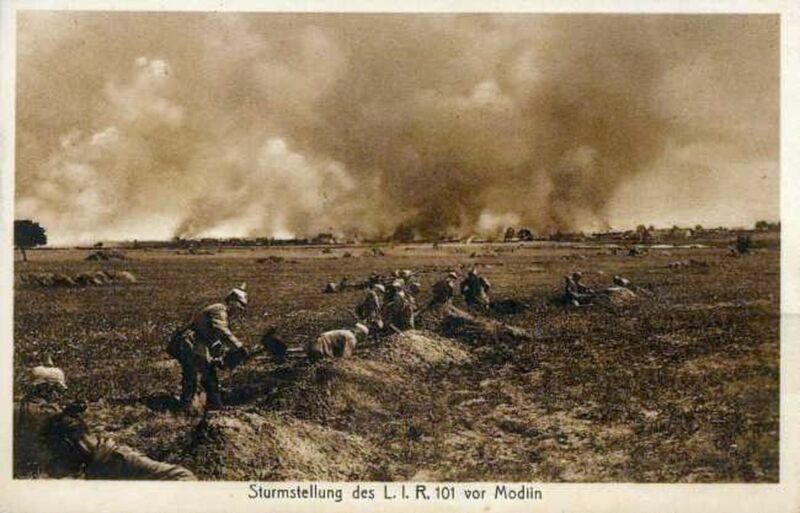 In the spring, the Germans pulled out most of their troops to prepare for their Spring Offensive on the Western Front, which, ironically would suffer the same fate as the Battle of Caporetto: stunning successes which resulted in logistic nightmares and exhausted troops. In June, the Austrians launched the Battle of the Piave River, hoping to take Venice and finish off the Italians. 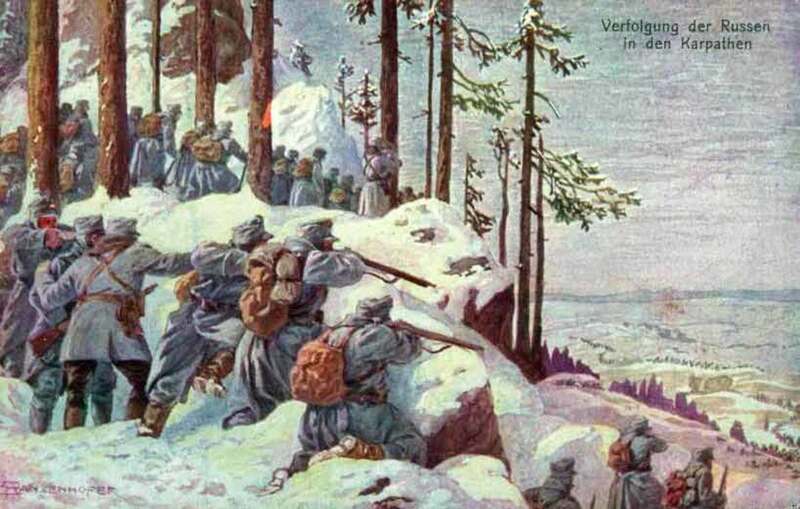 It was badly planned and the demoralized Austro-Hungarian troops were stopped by the Italians. In October, 1918, after rebuilding their forces-- much slower than the Allies had hoped for-- the Italians finally launched their own offensive across the Piave River, called the Battle of Vittorio Veneto. This time, the demoralized and weakened Austro-Hungarian's could not stop them. The Austrian line began to disintegrate, which soon reverberated through the Empire, leading to the overthrow of the ruling Habsburgs. On November 3, the Italians captured 300,000 prisoners and Austria-Hungary asked for an armistice and peace terms. Since the Austro-Hungarian Empire had collapsed, Austria and Hungary had to sign the armistice as separate countries. On November 4, the fighting was over. Austria-Hungary had lost 400,000 dead and 1,200,000 wounded on the Italian Front. Italy had lost 650,000 dead and 950,000 wounded. As payment for joining the Allies (and being on the winning side), Italy received only some of the territories promised. 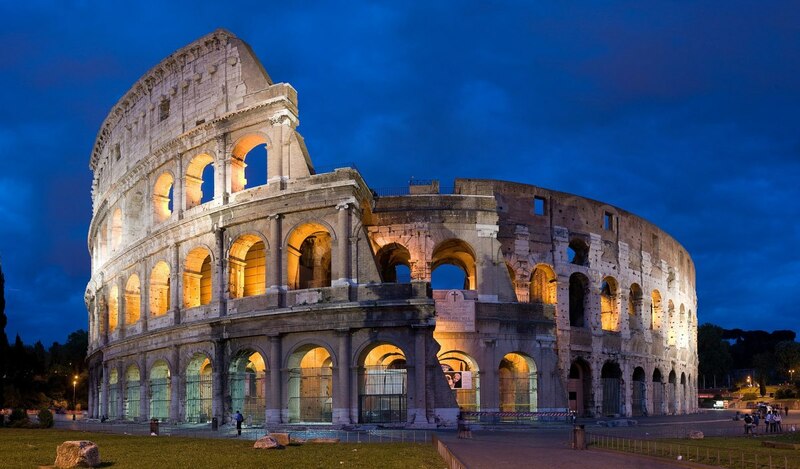 Once the details of the London Treaty were publicized, the British and French argued that Italy's contribution to the outcome of the war was limited and therefore many of the promised lands did not materialize. Italians would remember this the next time they had to decide which side to join. That wouldn't work out as well as they hoped for either. Did any British troops receive any medals on the Italian front? While British soldiers who fought in Italy received medals for heroism and campaign medals once the war was over, I haven't found any British medals that were made specifically for the those serving on the Italian Front. "...(though who's to say that war in general is not self-serving)..."
Well yes, war is self serving! The idea is to Not get involved. You might get killed or wounded. There is no need for an individual to join in the violence between or among governments, tribes or families. A nice piece of reading!!!!!!!! Congrats for this Article!!!!!! Thanks, emge. I think the Italians suffered from poor leadership during both World Wars. To suffer the kind of losses the troops incurred over and over again, however, is a testament to the bravery of the ordinary soldiers. Hi Don. Thanks for the feedback. I try not to just throw facts at my readers and I do spend time trying to frame them in a readable way. I'm gratified when I succeed in some small measure. A Good Read, and I really enjoyed your presentation of the facts. Gotta read more of your "stuff"! Thanks for commenting, stereomike83. Glad you enjoyed it. Winter in the Alps, freezing limbs, bullets, steel and stone fragments, avalanches. Nope. Congratulations on the HOTD. This was a really interesting read on an area of the war I knew very little about. One can only imagine the hardship of fighting in December in Alpine conditions. Thank you both, Patricia and Kristen, for reading and commenting. I myself learned a lot researching this article, even though it is just an overview. 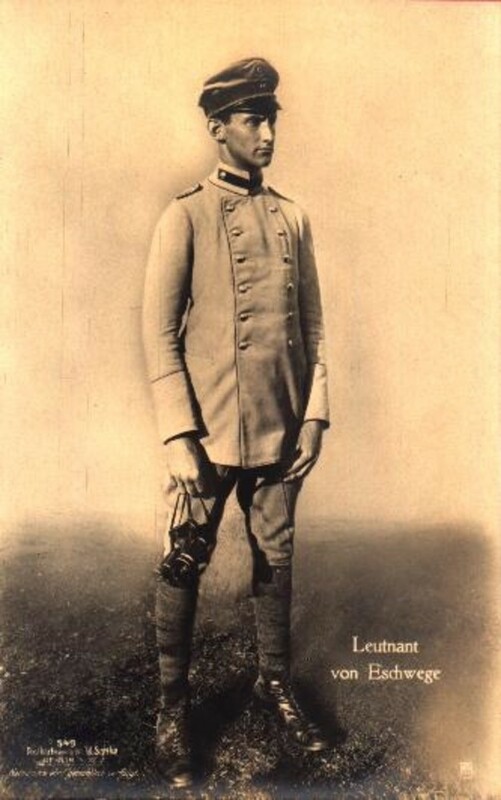 In general, both the Italian and the Austro-Hungarian soldiers were poorly led during the war and suffered massive losses, though the Austrians, on this front at least, fared better than on the Eastern Front, since they fought a mostly defensive war. Thanks again. David, this was another interesting chapter on the war and focusing on the Italians who fought in it and lost my battles. Congrats on HOTD! I am truly thankful my Daddy did come home!!! I was not even a glimmer in my Momma and Daddy's eye then. Hi jarethking. I'm glad to have sparked an interest. As a matter of fact, I feel the same way after researching this hub. I wonder what the world would be like today if the Italians had followed through and thrown in with the Central Powers. Thanks for the kind comment. Thanks, lions44. That's what I like about writing these-- I learn about things I didn't know in the process. The Italians were definitely poorly led. The Italian fronts in many seemed to have been forgotten (Napoleon's campaigns, WWI and WWII). I can be accused of that as well. But this was great. Just when I think I know everything...I learn something new. Great stuff. Hi Graham-- thanks for the comment and the vote up. Always good to hear from you. Hi UH. Another first class hub. Research is as usual first class. I have to admit that this side of the war has passed me by. I shall save this hub to absorbe the information. Thank you, shiningirisheyes. I'd never really followed events on the Italian Front, so I decided it was about time to educate myself-- and get another hub out of it. I knew it was bad, but never realized there were 12 battles in one area spanning the years of fighting. I was looking for images and came across Hemingway, so decided I should add something about him as well. So many fascinating areas to this war. I am learning so much fro your Hubs. As I have stated, my interest was always WWII but since you have been publishing these insightful articles, I am being drawn into another important chapter in History. Eleven blooding battles for Isonzo alone with such deplorable natural dangerous conditions, weather, rocks, avalanches! Unbelievable. And I never realized Ernest Hemingway's part in the war. Great hub my friend. I thank you and look forward to reading more. Ata1515, yes, the terms of the Versailles treaty virtually assured that a resurgent Germany would want revenge, given its terms. After WW2, many in the US leadership considered turning Germany into an agrarian state with virtually no industry. But then they decided an industrial Germany was needed as a bulwark against the Soviets. Pragmatic politics can sometimes even lead to doing the right thing. Interesting details of a what many consider a sideshow of the World War. One of the most important details of WWI is one that is often overlooked, and that was the treaties that ended the war. Those treaties left everyone bitter, and serve as a reminder to anyone studying history about how one should be gracious in victory. Hi Pavlo. Great to hear from you, as always. It seems to me that Russia suffered even more than Germany. Although WW1 ended, the fighting and civil wars went on for years in the destroyed Russian Empire!